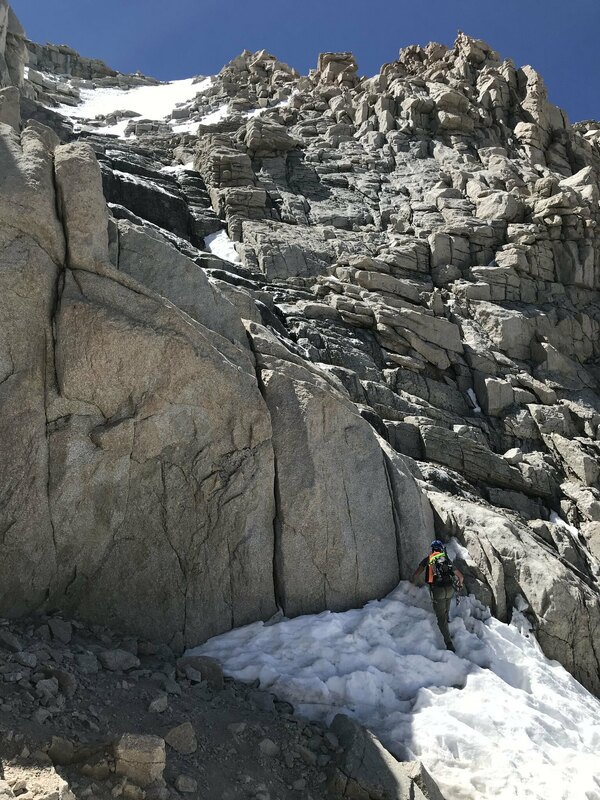 For the Final 400, which had a significant snowfield from about the halfway point on up, we took the first chute, staying to the (climber's) left the whole way in order to avoid getting on any of the snow. Our rationale being - if the traverse is too sketchy, then this can't be much better. We did rope in (simulclimb) the last 80 feet or so, which made us feel more confident in our moves and decisions. For the down climb we headed down the (descender's) left side of the first chute, which we again simulclimbed. Once we got below the snow field we traversed across to the (descender's) right side to down climb the remaining 200 feet or so with no rope. There were multiple rappel stations that looked pretty bomber along the (descender's) right side. We considered using them to construct a hand line but decided against it. How was the bouldery class 3 section on climbers right side of the final 400? That's how we down climbed... it was possibly a bit easier to find a hand or foot hold than staying to the left the whole way. But regardless, I'd bring a rope, harness, some slings and locking carabiners. Was the section to the right free of snow? Pics? Yes, that section was free of snow. If I were to do the final 400 again, my game plan would be to start going up the left side, then traverse across to the right side while staying beneath the snowfield. We down climbed this exact route and never got onto any snow/ice. I'll sift through some pics to see if I have anything that depicts this section. You can see in this image that once you get about halfway up the left side, you can traverse across to the right side while staying beneath the snow. That would be the way I would climb it if I were to do it again... Hope this helps! Generated in 0.090 seconds in which 0.076 seconds were spent on a total of 14 queries. Zlib compression disabled.